Suppose you can buy Toad in the Hole for one person from a supermarket for £1. Would it be cheaper to make it yourself if you want to feed a family of three? 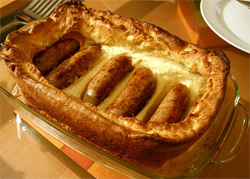 Toad in the Hole is a traditional English dish, consisting of sausages in a batter, and served with gravy. STEM - design technology. STEM - living world. Physics. Design. STEM - physical world. Calculating with decimals. Food technology. Calculating with ratio & proportion. Investigations. Maths Supporting SET.